Halloween is upon us and if you are looking to party or perhaps attend a masquerade ball, I can recommend these cool and extreemly well made accessories from Astralia. 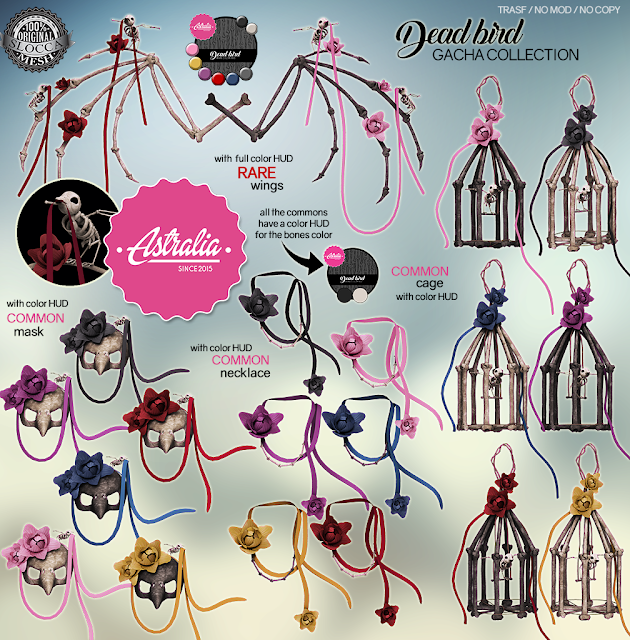 The wings, mask, cage and sicle are all accessories from Astralia, made for the Gacha Guardians event so you will have to play for them. You can go collect the hud to play at Astralia mainstore. THe hud will allow you to find and collect the rune stones at each location. You can read more about how you play at the website. The shoes are also from Astralia, available at Memento Mori. They are pretty awsome and also comes with a hud, that allows you to change every part of the shoe to different colors, but also the buttom part can be changed into a skull texture, liek the ones I am wearing. I simply love how the heels are decorated with spine bones, shaped like little ribbons. The lingerie is from Baiastice, that is beautiful and simple with its lace part in the front. It comes in various colors and shapes and for SLink bodies, but not for Maitreya, so be sure you try a demo. Hair is created with hair from Rayne Morgan.